As if there weren’t enough luxury flash drives already available in the market, the Polish firm Zana Design decided to release its own line and attempts at offering something fresh and unique to millions of USB users around the world. The flash drive is Zana Design’s Apophis GIANT. What makes it special custom shaped USB, which also gives it its own marketing pitch, is that the Apophis drive contains a piece of an ancient meteorite. The Apophis flash drive is named after a 1,280 foot asteroid that might collide with Earth in 2036; it might not even graze Earth, considering that there is only a 1/250,000 chance for a collision to occur. Anyway, back to the flash drive. Zana Design made sure that the flash drive was made out of the most luxurious materials available. The tip of the drive contains a piece of a meteorite that’s 4.5 billion years old. The casing is made out of 200-year old African black wood, said to be the most luxurious type of wood in the world. And to add a bit more luxury and extravagance into the mixture, you can have the drive plated to your preference, which will either be a 925 silver or an 18-carat gold. 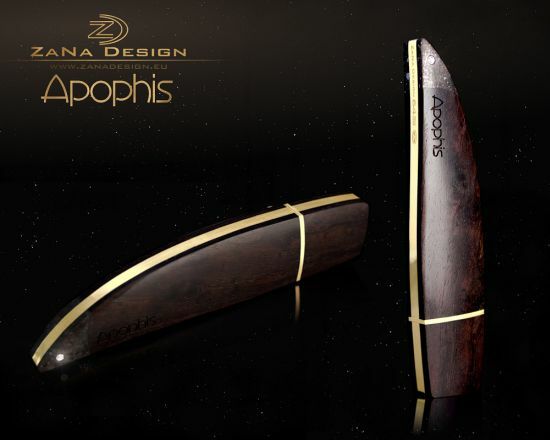 It’s a nice gesture that Zana Design did not choose to just focus solely on luxury; the Apophis GIANT flash drive performs decently and contains considerable storage to boot. The flash drive has a reading speed of 190 MB/s and has a storage capacity of 64 GB. It’s already obvious from the reading speed; the Zana Design Apophis flash drive is, in fact, a USB 3.0 drive. Being that the Apophis GIANT is a luxury flash drive, whoever wants to own it is going to have to shell out some serious dough. The silver edition (with 925 silver plating) will run you up a cool $1,130. The gold version (with 18-carat gold plating) fetches for a bit more at $1,990. Naturally, Zana Design offers a lifetime warranty for the flash drive should something go wrong with the parts. It’s not the most expensive and luxurious drive out there, believe it or not, but the Zana Design Apophis GIANT does make a neat acquisition for all the rich people who’ve always dreamed of owning a little bit of space. This entry was posted in Zana Design and tagged apophis, giant, luxury usb, zana design. Bookmark the permalink.